Catholic Enyclopedia: John Henry Newman Barry, W. (1911). John Henry Newman. In The Catholic Encyclopedia. New York: Robert Appleton Company. One Step is Enough for Me: the life of John Henry Newman, by Colin Battell, Prior and Dean of Hospitality at Ampleforth Abbey. Spero News. September 22, 2010.
Who was John Henry Newman? - An Interview with Father Carleton Jones, O.P. The Dominican Province of St. Joseph. August 25, 2010. (Father Carleton Jones, O.P., wrote his Doctoral Dissertation on Newman while studying at the Angelicum University in Rome. After fourteen years in the ministry of the Protestant Episcopal Church, Father Jones became a Roman Catholic in 1982, entered the Dominican Order, and was ordained in 1987). “Cor ad cor loquitur” John Henry Cardinal Newman’s Coat of Arms July 2, 2008 (Newman Friends International). Proclamation of John Henry Cardinal Newman as Venerable January 22, 1991. The Newman Reader The purpose of Newman Reader (NR) is to make the written works of Cardinal Newman available in as complete and accessible a manner as resources allow. To this end, the site provides three types of content: Written works themselves; Guides to the works such as indexes, lists and reading suggestions; ; Biographical information to supplement and provide perspective for the works, and statements from Popes and others that place Newman's life in perspective. Newman and the Idea of Sanctity, Edward Short. Catholic World Report "Though writing in the 19th century, Bl. John Henry Newman anticipated the fervor of today’s evangelical atheists who seek to disabuse us of what they consider the illusions of faith." (February 21, 2014). A Hero of the Church Eamon Duffy. (Review of John Cornwell's Newman's Unquiet Grave: The Reluctant Saint). New York Review of Books December 23, 2010. Newman and Benedict XVI: A Common Approach, by Andrea Kirk Assaf. Interview with Archbishop Nichols of Westminster. (Zenit November 25, 2010). The Influence of John Henry Newman on Benedict XVI, by Tracey Rowland. ABC Religion and Ethics | 16 Sep 2010. "Few English speakers seem to realise the extent to which Newman influenced German Catholic thought in the first half of the twentieth century, and particularly the theology of Joseph Ratzinger." Newman's defence of the Church: The Tracts for the Times, by Austin Cooper. ABC Religion and Ethics | 16 Sep 2010. That we should succeed by failure: Newman's Biglietto speech, by Ian Ker. ABC Religion and Ethics | 20 Sep 2010. On 12 May 1879, John Henry Newman received from the secretary of state the biglietto, or note, informing him that at the consistory that morning, the new Pope Leo XIII had elevated him to the college of cardinals. In response, Newman gave his famous so-called biglietto speech. A Glimpse Into the Soul of Newman | By Fr. Zeno, O.F.M., Cap. | An excerpt from "The Soul of Newman" (Chapter Twelve), from John Henry Newman: His Inner Life. "The Mystery of Newman" Lay Witness (March/April, 2009). Why John Henry Newman converted to Catholicism, by Michael Davies. AD2000 Vol 14 No 4 (May 2001), p. 10. The Conversion of John Henry Newman, by Peter A. Kwasniewski. (The Catholic Faith January/February 1999). Newman: Laity, Priesthood, And Holiness, by Fr. C. John McCloskey, III. A paper presented at the Academic Celebration on the 150th anniversary of the conversion of John Henry Newman: Christendom College, Front Royal, Virginia, October 9, 1995. Presentation by Joseph Cardinal Ratzinger on the occasion of the First Centenary of the Death of John Henry Cardinal Newman April 28, 1990. Newman Refutes Contemporary Liberal Theologians, by Fr. Edward J. Berbusse, S.J. Homiletic & Pastoral Review January 1984. 10/21/10: Oscar-winning actor to star in Newman biopic Catholic Herald October 21, 2010. 09/14/10: Catholic officials to investigate claims of second Newman miracle (Catholic News Service). 11/30/08: A Cardinal's Correspondence: Interview With Editor of Newman Letters Project (Zenit). This new edition of a classic anthology of the writings and sermons of the great John Henry Newman is a rare treasure house of Newman’s thought and inspiration. Released to coincide with the Beatification of Newman by Pope Benedict XVI in Newman’s homeland, England, where Newman’s spiritual influence on his own contemporaries was immense, this collection shows the timeless wisdom of Newman and how strong an appeal his writings have for the modern Christian. In his sermons, often praised for their freshness and originality, Newman had a style of relating the plain truths of the Gospel in a realistic and empathic way. He saw the great importance of the individual differences in human souls, and a unique feature of his approach was always to speak to people as individuals. In this outstanding anthology, Fr. Erich Przywara, S.J., organizes Newman’s thought systematically and in its completeness. He divides the writings and sermons into twenty-one categories by such themes as God, Miracles, Faith, Scripture, the Church, Body of Christ, Eternal Life, etc., drawn from 25 works by or about Newman. Unlike some spiritual books, which were written in foreign languages, Newman's works were originally written in modern English. His style is very familiar and readable. This volume is an excellent combination of Newman’s insights on spirituality, prayer, doctrine, philosophy, and it probes into the nature of God and his Church. This official biography is written by an Australian priest of the Oratoire de France and destined to be read by those from the world over due to the beatification of Newman in September by Pope Benedict XVI. They will find in this book an extraordinary grasp of Newman's significance and a genius for making it known. It is illustrated throughout with beautiful photographs and images that bring to life Newman and his world. John Henry Newman is a figure of immense significance for the Universal Church. His prophetic voice continues to speak far beyond the confines of 19th-century England. Almost every issue of significance for the Church today is enlightened by reference to his spirit, life and thought. The relationship of these three elements, the spiritual, the moral and the intellectual, is at the heart of Fr. Keith Beaumont's book, the official biography commissioned for the Beatification. Fr. Beaumont's biography gives a clear account of all the major themes of Newman's life and work, with judicious use of citations from this work so that Newman's thought is in almost every case conveyed in his own words. Fr Beaumont also directs us to some lesser known sources to give us a balanced and complete view of the subtlety of Newman's thought. Lavishly illustrated with photos and art on every page. This book is a culmination of Father Zeno's life work. With the cooperation of the Oratorian Fathers, he was given full access to all of Newman's letters, diaries, and complete published and unpublished sermons. From all this he has drawn together the interior struggles Newman faced from childhood until his death. Zeno allows Newman to speak through his work and writings, an exceedingly rich source. This is a landmark work considered one of the best spiritual biographies of John Henry Newman ever written. This book was first published in Dutch and met with immediate and extensive acclaim. It covers Newman's young life as an Anglican, the doubts he faced in light of his historical studies, his conversion to Catholicism, the trials he faced as a result of his conversion, and his remarkable growth in holiness and the interior life. "It took me, all in all, fifteen months to examine the 430 files of letters in the Archivium and the formidable collection of papers, journals and memoranda in the cupboards of the Cardinal's room... Studying the forty-five volumes of Newman's works which had up to then been published also required much time. While I read and copied out what threw light on his inner life, the outlines of Newman's soul gradually became clear to me: the following pages are the result of this labor of love." This full-length life of John Henry Newman is the first comprehensive biography of both the man and the thinker and writer. It draws extensively on material from Newman's letters and papers. Newman's character is revealed in its complexity and contrasts: the legendary sadness and sensitivity are placed in their proper perspective by being set against his no less striking qualities of exuberance, humour, and toughness. This book attempts to do justice to the fullness of Newman's achievement and genius: the Victorian 'prophet' or 'sage', who ranks among the major English prose writers; the dominating religious figure of the nineteenth century, who can now be recognised as the forerunner of the Second Vatican Council and the modern ecumenical movement; and finally, the universal Christian thinker, whose significance transcends his culture and time. John Henry Newman (1801-90) was a major figure in nineteenth-century religious history. He was one of the major protagonists of the Oxford or Tractarian Movement within the Church of England whose influence continues to be felt within Anglicanism. A high-profile convert to Catholicism, he was an important commentator on Vatican I and is often called 'the Father' of the Second Vatican Council. Newman's thinking highlights and anticipates the central themes of modern theology including hermeneutics, the importance of historical-critical research, the relationship between theology and literature, and the reinterpretation of the nature of faith. His work is characterised by two elements that have come especially to the fore in post-modern theology, namely, the importance of the religious imagination and the fiduciary character of all knowledge. This Companion fills a need for an accessible, comprehensive and systematic presentation of the major themes in Newman's work. This is an introduction to one who may be considered the most outstandingly original and creative English religious thinker of the nineteenth century. Newman may be considered the most outstandingly original and creative English religious thinker of the nineteenth century. Here is by far the clearest and most concise introduction to his life and thought ever written. Avery Dulles is himself one of the most important living Roman Catholic theologians. The combination of this author and this subject is in itself a matter for celebration.Newman has countless admirers. Since the publication of Geoffrey Faber's Oxford Apostles many have also attempted to debunk him. But here is an account of Newman that is truly balanced and shows him to be as much a prophet for our times as he was for his own. Though unsuccessful in most of his undertakings in the Catholic Church during his life time, his genius has come to be more and more recognized after his death, and his influence can hardly be exaggerated. While writing this study of Cardinal Newman, Avery Dulles was himself created a Cardinal. Joseph Ratzinger was first introduced to the work of Cardinal Newman as a young seminarian, and has taken a keen interest in him ever since. The editor, Peter Jennings, has skilfully assembled key documents by the new Pope about Cardinal Newman, as well as important contributions from a number of leading churchmen. The thought-provoking sermons given during the Newman Centenary celebrations in Birmingham, in 1990, are published together here for the first time. An engaging and valuable resource, extensively illustrated, that will appeal to both Newman scholars and devotees alike, at a vital time in the history of the Cause of Canonization of Cardinal Newman. From Templeton Prize-winning author Stanley Jaki comes a penetrating interpretation of the thought of Cardinal Newman. This study of John Henry Cardinal Newman (1801-1890) confronts a variety of misperceptions of the famous English churchman, especially those that diminish Newman's deep appreciation of the supernatural. As Stanley Jaki writes, "Newman's chief challenge today, as in his times, aims at the defense of the supernatural." Jaki shows that such a defense was, for Newman, far more than a simple intellectual enterprise: for him the supernatural was above all a spiritual challenge of the profoundest sort. In this volume Jaki begins with an overview of the challenge that Newman set for himself and for the church, and he then unfolds this challenge across a dozen key topics drawn from Newman's writings. Jaki shows that much as the topics of original sin, angels, miracles, Anglo-Catholicism, conversion, and papacy may differ from those of assent, science, evolution, and history, they all bespeak Newman's total engagement with the concretely given supernatural. This book provides the first critical edition of John Henry Newman's classic work, A Grammar of Assent. The editor's introduction contains a synopsis of Newman's argument as well as an account of the development of his thought and a history of the composition of the final text. Ker discusses critical reaction to the Grammar and attempts to clarify and interpret Newman's thoughts in areas where his meaning has been misunderstood. A Textual Appendix lists every variant published in Newman's lifetime and the editor's Notes include detailed references to Newman's other writings. full use has been made of the manuscript drafts and all available philosophical notebooks and papers. John Henry Newman's conversion to Roman Catholicism rocked the Church of England to its foundation and escalated the spread of virulent anti-catholicism in Victorian England. A rigorous examination of his own religious development, enlivened by touches of satire and sometimes invective, Apologia pro Vita Sua is a spiritual autobiography of great power. Since its publication almost 150 years ago, "The Idea of a higher education" -- the issues that John Henry Newman raised - the place of religion and moral values in the university setting, the competing claims of liberal and professional education, the character of the academic community, the cultural role of literature, the relation of religion and science - have provoked discussion from Newman's time to our own. This edition of The Idea of a University includes the full text of "University Teaching" and four selections from "University Subjects", together with five essays by leading scholars that explore the background and the present day relevance of Newman's themes. In the essays Martha Garland discusses the character and organization of the early 19th-century English universities upon which Newman based much of his vision; Frank M. Turner traces the impact of Newman's influence during the vast expansion of higher education since World War II; George Marsden investigates how the decreasing emphasis on religion has affected higher education; Sara Castro Klaren examines the implication of Newman's views on education and literature for current debates between proponents of a curriculum based on western civilization and one based on multiculturalism; and George Landow considers what the advent of electronic communication will mean to university teaching, research and community. To aid accessibility, the edition also includes an analytical table of contents, a chronology and biographical sketch of Newman's life, questions for discussion, expanded notes, and a glossary of names, all of which should help make this the standard teaching text of Newman's work. In November 1992 the Church of England made its final decision about ordaining women. In March 1994 the first' such ordinations took place in the Bristol cathedral. Between those two dates several bishops and hundreds of priests of that Church asked to be admitted to the Catholic Church. They are those Anglo-Catholics for whom that decision became the last straw. But was it really logical for Anglo-Catholics to wait for that fateful decision? Were Newman alive today, he would point at these much ignored Lectures of his delivered in 1850. There he argued, in the wake of a similarly fateful decision, that Anglo¬Catholics, who took seriously their Catholic aspirations, had no choice but to join Rome. The Lectures are both a penetrat¬ing portrayal of what Newman called "the mimic Catholi¬cism" of the Church of England and a most authentic analysis of what the Oxford Movement was truly about. In the light of recent events, Anglican Difficulties may emerge as the prophetic book penned by Newman. The pro¬phecy is about a "most painful logic at work in ecumenism." An Essay on the Development of Christian Doctrine, reprinted from the 1888 imprint, "is rightly regarded as one of the most seminal theological works ever to be written," states Ian Ker in his foreword. "It remains," Ker continues, "the classic text for the theology of the development of doctrine, a branch of theology which has become especially important in the ecumenical era." John Henry Cardinal Newman begins the Essay by defining how true developments in doctrine occur. He then delivers a sweeping consideration of the growth and development of doctrine in the Catholic Church, from the time of the Apostles to Newman’s own era. He demonstrates that the basic "rule" under which Christianity proceeded through the centuries is to be found in the principle of development, and emphasizes that thoughout the entire life of the Church this law of development has been in effect and safeguards the faith from any real corruption. Ker concludes that, "we may say that the Essay is not only the starting point for the study of doctrinal development, but so far as Catholic theology is concerned, it is still the last word on the subject, to the extent that no other theologian has yet attempted anything on the same scale or of similar scope. . . . But even if the Essay was not one of the great theological classics, it would still be of enduring interest for two reasons. First it is one of the key intellectual documents of the nineteenth century, comparable to Darwin’s Origin of Species, which it predates by over a decade. Second, if this were the only book of Newman to survive, its rhetorical art and style would surely place him among the masters of English prose." "I would feel presumptuous in recommending John Henry Newman. It is like saying Mozart is a great composer. One can only acknowledge that Newman is one of the spiritual masters of world history, and express gratitutde for this intelligent selection from the feast of his genius." -- Fr. Richard J. Neuhaus. 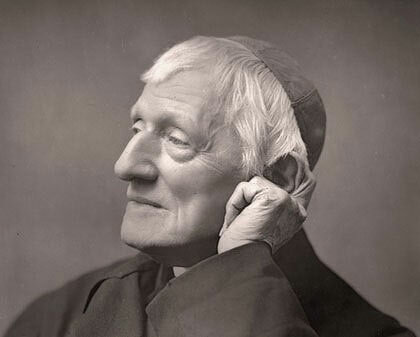 John Henry Newman, the most seminal of modern Catholic theologians, is often called "the Father of the Second Vatican Council," the teachings of which he anticipated in so many ways, especially in his ecclesiology, with its emphasis on the role of the laity, but also in his theory of the development doctrine, his ecumenism, and his concern for the renewal of Catholicism in the modern world. Without that so-called ressourcement or return to the Scriptures and the Fathers, which has characterized so much of the most invigorating Catholic theology of the 20th century, the reforms of Vatican II would hardly have been possible. Similarly, Newman's though owes its originality paradoxically to his returning to the past to recover and revitalize those forgotten truths of Christianity, which he found preeminently in early Greek Fathers. It is this profoundly Biblical and Patristic theology that lies at the heart of Newman's spirituality, which is to be found above all in that great classic of Christian spirituality, his Parochial and Plain Sermons, preached from the pulpit of the university church of St. Mary the Virgin, Oxford, and from which the most of the selections in this volume are taken. The extensive writings of Newman (1801-90) remain important in our time. Newman, who has been advanced for canonization, was an English Catholic theologian and controversialist, poet, and musician whose rapier pen wrought devastation on his enemies. This collection of four essays includes three shorter works, The Theory of Developments in Religious Doctrine (1843), On Consulting the Faithful in Matters of Doctrine (1859), and two chapters of A Letter Addressed to His Grace the Duke of Norfolk (1874). The classic An Essay on the Development of Christian Doctrine (1845), which led Newman from Anglicanism to the Roman Church, is included. Compiler Gaffney provides clear commentaries on the selections he calls "revolutionary," which are useful for studies in developmental theology. This is recommended for religious collections and informed lay readers. - Anna Donnelly, St. John's Univ. Lib., Jamaica, N.Y.